Everyone wants relationships of some sort and this is where Astrology can help. Astrology being a science of the soul can give you deep insights into your compatibility with your partner or potential partner. Relationships are fundamental for happiness, success and serenity and it is the most challenging problem and the most powerful emotional experience on the earth plane. Your relationship karma is revealed through the planets. People often very much wish to change their lives and discipline their intentions; nevertheless, the planets keep them lethargic, goofy, negative and unconscious. On 26th May, the planetary energies are so much aligned to give all the beneficial results mentioned and hence AstroVed is conducting the special service of chanting Taittiriya Upanishad and the Aikyamatya Suktam Homa for the peace, unity, prosperity and spiritual upliftment of each person, their families and the society as a whole. On May 26th 2016, the Moon (planet which rules our minds), and Jupiter (planet of expansion) are in an auspicious geometrical position to each other. Moon is receiving the favorable aspects from Jupiter as well. Together they work to expand the mind, heighten the spiritual inclination leading to an evolution in the consciousness. The success of this pursuit is determined by the star Lord of the Moon, who is the Sun himself. He is placed in the 10th House from Jupiter, which is the House of action. The Sun-Jupiter duo’s angular placement creates a strong Raja Yoga. Sun represents the soul and Saturn decides the karma path through which the soul has to travel. These two destiny-deciding planets are also in angular placements aspecting each other. Saturn is further placed in the transformational house of Scorpio, with its Sign Lord Mars. The Sign Lords of Sun, Saturn and Jupiter are all strong and powerfully placed. All these factors reinforce the positive success of the pursuit, to all those who earnestly wish for it. The retrograde motion of both Mars and Saturn is an additional boon. It indicates that this time is very conducive for freeing oneself of past karmas. Since being in touch with one’s own self is important for spiritual evolution, AstroVed organizes a special chanting of Taittiriya Upanishad with Aikyamatya Sooktham Homa. Taittiriya Upanishad is a part of Krishna Yajur Veda, and mere listening to the sounds of chanting will create great joy and peace in the minds of the listeners. That is the effect of the syllabic sounds that emanate from the chanting of these hymns. The verses are grouped under 3 sections, each one with a very clear purpose towards awakening and enlightening the listener’s mind. The first section provides clear instructions on character building, since only those with strong will and character can succeed in their pursuits. Therefore, this section deals with the rules for right living. The order of creation, the potential of the human mind, intellect and its expanse is explained in the second section. How well equipped are we to create a successful path both materialistically as well as spiritually is explained clearly in this section. The third section talks about the sage by name Brigu, who achieved all this by using proper methods and practices that were imparted to him by his father who also was his Guru. The third section also talks about the physical body with the 5 subtle bodies referred to as Koshas in the Upanishad. The Sanskrit word Aikyam means union. The world is created such that we are all the strands of the same being or nature. It is very important to understand this and live as well as work in unison with one another. When this becomes the habit for every individual, then there will be peace in the families, states, countries, nations and the world itself. For this, each one of us should be at peace with our own selves. The Aikyamatya Suktam upholds this principle and has verses when listened to will resonate with that inner feeling of love, cooperation and oneness. Participate in the special rituals on May 26th (IST). The special service of chanting Taittiriya Upanishad, and the Aikyamatya Suktam Homa will be performed for the peace, unity, prosperity and spiritual upliftment of each person, their families and the society as a whole. The Sign Lords of Sun, Saturn and Jupiter are all strong and powerfully placed on May 26th (IST) and all these factors reinforce the positive success of the pursuit, to all those who earnestly wish for it. An archana will be performed at the powerful vortex to strengthen your relationships. It will resonate with that inner feeling of love, cooperation and oneness.The complimentary pendant with Rose Quartz stone will be energized in the Aikyamatya Suktam homa on May 26th (IST). Note: Kindly mention the name of the person and the relationship to be strengthened. 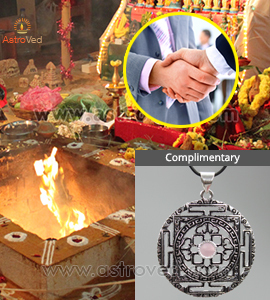 You will receive the energized Pendant with Rose Quartz stone along with sacred grey ash powder and kum-kum (Red Vermillion Powder), which will be blessed in the rituals. Keep this on your meditation altar and wear it on your forehead during meditation or at other times to expand the Divine blessings into your life. Please Note: Your energized Pendant with Rose Quartz stone and Prasad will be shipped from Chennai, Tamil Nadu. Please allow 2 – 4 weeks for delivery time after the entire set of rituals is performed.